Used in the gaps between the plasterboard! 5kg or 10 kg per bag. Used for plaster wallboard finishing and texturing. Do not mix with other material. 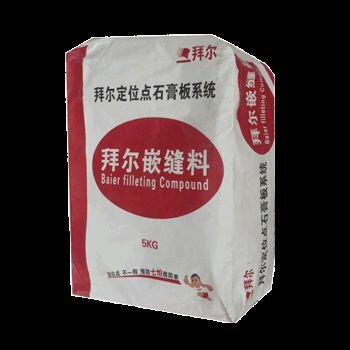 If the joint compound is dry,carefully add water to read the desired consistency.The best way is 1kg jointing compound with 550ml water. 1 Apply the compound into any gap between the boards and fill the taper.Cut a piece of tape and press into the joint.cover the tape with the compound,and remove the redundtant,make sure the joint keep the same level with the surface,the first joint’s width is 100-120mm. 2 After the first coat is set and and dried apply a further coat,extending 50mm to 60mm on each side.Ensure that the coat is tight and featured into the board surface. 3 Once the second coat is set and dried apply a final coat extending 50mm to 60mm on each side ,ensure that it is tight and featured into the board surface. 4 After the final coat is set and dried ,the joint should be lightly sanded using 120 grit paper held in hand or pole sander. The compound should not be used in temperatures above 45â or below 0â.It must be applied over every wallboard joint.To ensure an adequate adhesion of the compound the tape must be firmly pressed against the board using a hammer head joint knife,uniformly distributing the compound.Likewise,apply multi-used compound over screw heads and plastic or metallic corners.To obtain better results,apply two or three compound layer over the tape.Clean excess compound off the board before it dries.Make sure that dry compound does not come into contact with the remaining mixture. Stocking:Store off the ground and in a dry environment,for the one haven’t used off seal to store. When mixed with water,this material hardens and becomes very hot sometimes quickly.Do not attempt to make a cast enclosing any part of the body using this material.Failure to follow these instructions can cause severe burns that may require surgical removal of affected tissue or amputation of limb.Dust can cause eye,skin,nose,throat or respiratory irritation.Avoid eye contact and inhalation of dust.Water eye protection.If eye contact occurs flush thoroughly with water.If dusty,water a NIOSH/MSHA approved respirator.Prolonged and repeated exposure to respirable crystalline sillica can cause lung disease and/or lung cancer.Use proper ventilation to reduce dust exposure.Do not ingest.If ingested call physician.